According to factual information released by the Russian Interstate Aviation Committee (IAC), the Tupolev 204 that suffered a runway excursion at Moscow’s Vnukovo Airport landed fast and never decelerated below 200 km/h (108 knots) on landing. 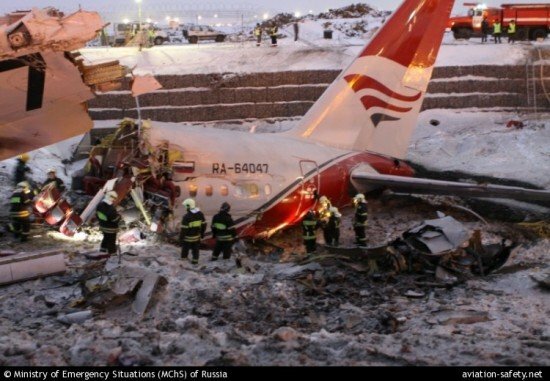 On December 29, 2012, Red Wings Airlines Flight 9268 approached Vnukovo Airport from the north. The Tupolev 204, on a repositioning flight from Pardubice, was cleared for landing on runway 19. The airplane was fully configured for landing with flaps at -37°, slats at -23°, and landing gear down. Decision height was 60 meters and the planned final approach speed was 210 km/h (113 kts). The final approach was flown in director mode with disabled automatic throttle. The approach was flown at a speed of 255 km/h (138 kts) without significant deviations from the glide path. The airplane passed the runway threshold at a height of 15 meters (50 ft) and an airspeed of 260 km/h (140 kts). The throttles were moved to the ‘idle’ position and the airplane touched down at a speed of 230 km/h (124 kts), at a distance of about 900 – 1000 m (2950-3280 ft) from the threshold of the 3060 m (10.040 ft) long runway. The aircraft touched down on the left hand main gear first while the wind was gusting to about 11,5 m/sec. When the nose gear touched down, the right hand undercarriage strut had not yet compressed. Immediately the crew moved the throttle levers to “maximum reverse”. The thrust reversers did not deploy. Also, the air brakes and spoilers did not deploy automatically. After selecting maximum reverse, thrust was increased to 90% (nominal operation). The minimum speed on landing was 200-205 km/h (108-111 kts). After that the speed increased to 240 km/h (130 kts). The increase in speed led to additional “unloading” of the main landing gear. The airplane rolled left and right but there was no simultaneous touchdown of both main landing gears. The pilots used the brakes but they were ineffective because the pressure in the wheel brakes is only applied when both landing gear struts are compressed. Five seconds after switching off the “maximum reverse”, the flight engineer requested the reversers be activated again. Maximum reverse was selected again with the engines spooling up to 84% thrust. The reversers still failed to deploy. Thirty-two seconds after touchdown the airplane had reached the end of the runway. It crossed the runway threshold at a speed of 215 km/h (116 kts). The flight engineer shut down the engines at the request of the captain. Then both landing gear struts compressed, causing the automatic release of air brakes and spoilers as well as the deployment of the thrust reversers. The distance between the end of the runway and the M3 highway embankment is about 320 m (1050 ft) on downsloping terrain with a sharp dropoff of 10 metres (33 ft) at the embankment. The airplane collided with the embankment at a speed of 190 km/h (103 kts). It broke in three and the forward part of the fuselage came to rest on the highway.